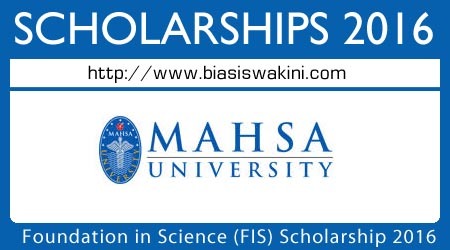 Foundation In Science Scholarship 2016 offered by Mahsa Universiti to Malaysia citizen who meet the following requirement may apply for the Foundation in Science Scholarship Fund 2016. - All results based on SPM. English 1119 not considered as a subject by itself for all categories. Fee waiver will be deducted from the last semester fees. - MAHSA reserves the right to revoked the scholarship at any time in the event of gross misconduct. - The stipulated amount can be changed as deem by the university at any time. - Scholarships awarded shall be based on actual results only. Provisional or forecast results will not be accepted. 0 Komentar untuk "Biasiswa Mahsa Universiti - Foundation In Science Scholarship 2016"